Mexico 1, Panama 0: Oribe Peralta’s goal enough to see off Canaleros..
BRIDGEVIEW, Illinois. Oribe Peralta’s goal in the 59th minute was enough for Mexico to see off CONCACAF rivals Panama 1-0 in their final friendly of 2016. The first half saw Mexico gain a lot of the ball possession, but Mexico had a hard time creating chances against a compactPanama defense. In fact, Panama had more half chances on the counter during the first half than did El Tri. 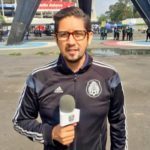 However, El Tri had the best chance of the first forty-five minutes with two minutes left, when Panama goalkeeper Jose Calderon was forced to make a save on the shot by Giovanni Dos Santos. Dos Sanros’ shot came after a well-organized first-time buildup down the left resulted in a low cross that found the LA Galaxy striker in good position to score. Once the second half began, Mexico started to send multiple players on Panama defenders and attackers to try to win the ball and create odd-man situations on the Panama goal. The change in defending tactics and off the ball movement contributed to Mexico’s first goal of the game. In the game’s 59th minute, Oribe Peralta finished off a low cross from the left to open the scoring for El Tri. 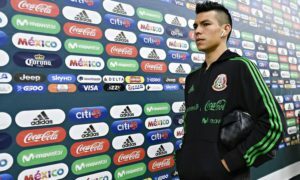 The play was helped by a long first-time passing streak that included a dribble and switch pass from Jesus Gallardo to Hirving Lozano that took out four defenders collapsed around Gallardo. Eventually, after Hirving Losano sent a shot over the crossbar on a 73rd minute counterattack, Mexico elected to cede possession and work on ball recovery and closing down attackers. However, in the game’s 89th minute, Moises Muñoz was forced to make a point blank save on the shot by Armando Cooper. In the end, Mexico held on for the victory and extended their unbeaten run since losing 7-0 to Chile in the 2016 Copa America quarterfinal. 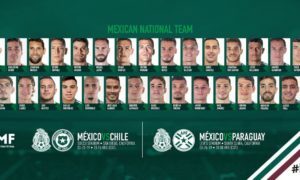 Juan Carlos Osorio’s side will try to carry their recent momentum into the Hexagonal round of CONCACAF World Cup qualifying on Friday, November 11 when it travels to Columbus, Ohio to take on the United States’ national team. Mexico travels to Panama City on Tuesday, November 15 to take on the Canaleros in an official competitive match. 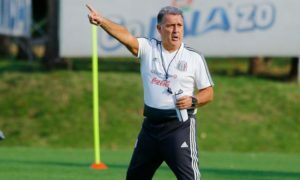 Hernan Dario Gomez’s side will travel to Homduras on Friday, November 11 to take on Los Catrachos and return on November 15 to Panama to take on El Tri.